Here’s another shot from last Easter Weekend. This is the South Stack Lighthouse on the Western Coast of the Isle of Anglesey in North Wales. Giant cliffs loom over the rocky peninsula where this beacon shines out into the water and when the light spins around, it casts an eerie glow back onto the land. My camera didn’t pick up the light returning back to the land and though I probably could have done a longer exposure to show the spotlight’s streak upon the cliffs, I thought it would have started looking pretty artificial, so I went for this classic view of the lighthouse at dusk instead. 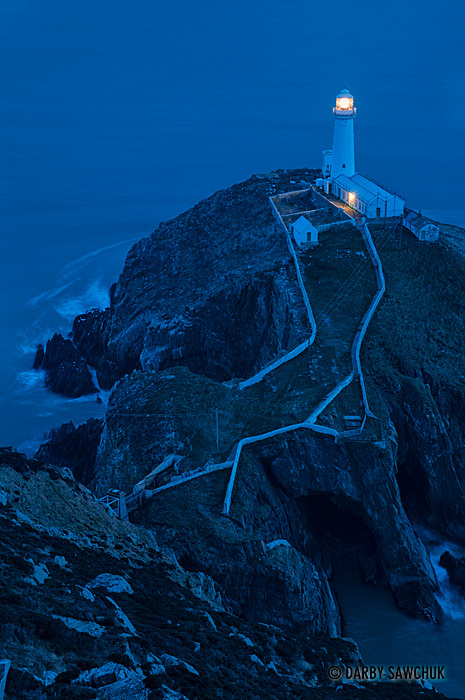 Please visit my Wales image gallery to see more photos of North Wales.